Born from respect for the environment and the need of energy saving the attention of Graffietti Stampati against the use of renewable energy. Here it is being finalized to install a photovoltaic system on the roof of our factory. 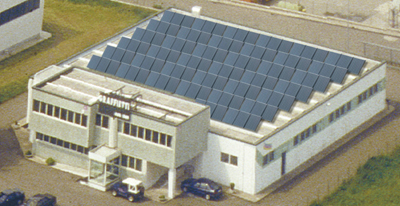 The plant, built by the company Com.it.e.a. Ltd. with the advice and financial assistance from the Bank coop. Catholic Montefiascone, will have a capacity of 50 kWh and will start producing electricity from next October. Our company, with this initiative, will avoid the emission into the atmosphere of well-26.5 Kg / hour of carbon dioxide. After a full year of production will save our beautiful planet about the emission of 35,000 kg of carbon dioxide that would be generated by the combustion of oil used by conventional power plants. Unfortunately, the installations are only part of the overall needs of our company but we can also say that in those moments when the plant produces energy but is not used, for example on holidays, the electricity will still be placed in national circuit and used by Enel SpA. The realization of this has been possible thanks to the DL n.387 of 29 December 2003 Article 7 which provides encouragement for the production of electricity through photovoltaic conversion of solar energy with the provision of assistance by the GSE. An ‘important initiative of the European Community that we hope everyone can help give our children a cleaner world.